Tim Burton's The Nightmare Before Christmas was an enjoyable movie. After it was released on DVD, it was later released again as a special edition DVD. And now it has been released once again, this time as a 2-disc collector's edition. What's new? What's different? Is it worth it? Seeing as how my wife is a huge fan of this movie, I will do my absolute best to answer these questions. Okay, so the first noticeable difference is the packaging. Unlike standard plastic DVD cases, this one is more like a box made from cardboard. The front of the box has a rectangular window cutout, under which is a plastic three-dimensional mold of Jack Skellington's head. The grayish curving lines on the outside of the box are actually partially reflective, showing a rainbow of colors when looked at from various angles. Folding open the box reveals a plastic inside, with two discs on the right side and one disc on the left side. Yep, that's three discs, because one is not for use with DVD players. It's for putting a digital copy of the movie on your PC, or whatever other portable device you happen to have that can watch movies. I have no need or desire to waste hard disc space on my PC with a movie for which I have the DVD, so I can't say much about this digital copy DVD other than what the little insert slip of paper says, which is that it works on both Mac and PC. The reverse side of this paper gives you a unique activation code, which I assume has to do with some sort of copy protection. I don't know why they don't just give that up already. If people want a copy of the movie, they're going to find a way to get a copy. Adding copy protection and codes and whatnot just makes it more annoying for the rest of us. But whatever. Let me move on to the discs that are for use in real DVD players. 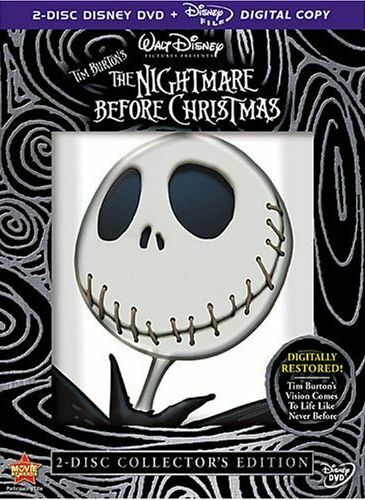 Disc one contains the movie, with an all-new commentary by Tim Burton, Henry Selick (the directory, and Danny Elfman (music designer and singing voice for Jack Skellington). The previous Special Edition DVD release had a commentary by only Henry Selick. Personally, I always ALWAYS prefer commentaries that have more than one person talking. With just one person, there's nobody to play off of, nobody to interject thoughts, nobody to laugh with, and it always just ends up getting boring very quickly. So with three people, this commentary is definitely more interesting, and it's a good mix of people too, the three guys who really made this movie what it is. Also on the first disc is "Backstage Disney", which includes What's This - Jack's Haunted Mansion Holiday Tour , Tim Burton's original poem (narrated by Christopher Lee), and the making of Tim Burton's The Nightmare Before Christmas. Out of these three features, both the Haunted Mansion tour and the original poem are new. The making of can be found on the previous Special Edition release. The Haunted Mansion tour is a virtual tour of the Haunted Mansion found in Disney Land (or Disney World, they're both very similar so I'm not sure which they used). Basically, a camera guy just goes though the mansion like you would if you were actually there. Here, on film, it's actually pretty boring. It's way better in person. It was actually a little shocking to see this Haunted Mansion, which I saw several times as a kid, completely filled up with Nightmare Before Christmas stuff. The poem is... well it's just a poem written by Tim Burton after he got the idea for the basic story of Nightmare Before Christmas. Christopher Lee reads it, which works well as that dude has a cool voice. It's a nice poem, and makes for a good comparison to the film. Actually, the two are very, very similar. Almost too similar. It shows that not much was changed when adapting it to a feature length film, with I personally feel was a mistake. The main problem I've always had with the movie is that it was not only kind of short (76 minutes, including the end credits), but felt like what was there was stretched out to fit the short length. The movie always felt like it could have been done as an hour-long television special, which would be about 40-something minutes due to commercial space. As a feature film, I think it needed more story elements. Like perhaps Oogie Boogie trying to take over as Pumpkin King while Jack was away. Or maybe have the inhabitants invade Christmas Town, and then have a resistance force of elves. You know, just something more! The second disc contains two of Tim Burton's early films, Frankenweenie (with an all-new intro by Tim Burton) and Vincent. Both of these films were included in the Special Edition DVD release, with only the Tim Burton introduction being new. Also on the second disc are deleted scenes, something called The Worlds of Tim Burton's The Nightmare Before Christmas , some storyboard-to-film comparisons, and posters and trailers. The deleted scenes and the storyboard-to-film comparisons can both be found on the Special Edition DVD release. The Worlds of Tim Burton's The Nightmare Before Christmas is a collection of animation tests, character designs, and concept art. Out of these, only the animation tests are new, the others can be found on... you guessed it, the Special Edition DVD. And then finally there's posters and trailers. No big whoop there. Both this Collector's Edition and the previous Special Edition contain Dolby Diginal 5.1 Surround Sound, DTS 5.1 Surround Sound, a 1.66:1 widescreen aspect ratio, and French and Spanish language tracks and subtitles, so no change there. And that's pretty much it for the difference between the Collector's Edition and the Special Edition. So is it worth getting the Collector's Edition if you already own the Special Edition? Absolutely not. To review, the only new stuff you get is an improved audio commentary, a boring virtual tour of the Haunted Mansion in Disneyland, a poem, a new introduction to Frankenweenie, and some animation tests. I'd hardly say that's worth blowing $32.99 (list price), or even $22.99 (Amazon.com price). So what about if you don't own a previous version? Well, that's a little tougher. The new commentary and the poem are nice additions, but the Collector's Edition still costs twice as much as the special edition, so I'm not sure I think they would be worth having that much. Then I guess it also depends on if you'd want to put the movie on your computer or ipod, and don't know how to do so with a regular DVD. So ultimately, it comes down to what you want and how much you're willing to pay. The Nightmare Before Christmas is a good movie, and if you haven't seen it I'd say definitely check it out. Is it a great movie? My wife would say yes, but I would say while it's great to look at and definitely enjoyable, the story is a bit lacking. If you haven't seen it, give it a rental first, then decide if you want to buy, and which version you would prefer to own. You can learn more, view film clips, and play games at NightmareBeforeChristmasDVD.com. And for more, also check out DrFinklesteinsLabWidget.com.